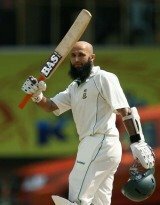 Hashim Amla scored his fourth test century and his first against India as South Africa dominated the second day. The day started with SA on 304/4 with Hashim Amla on an unbeaten 85. He did not waste too much time getting to three figures hammering Sreesanth for three boundries in a row. De villiers played one shot too many to edge a Sreesanth delivery to Dhoni, he made 44. Sreesanth bowled a good spell in the morning troubling the batsmen with pace and movement and looked like the only bowler capable of getting any breakthrough. After De Villiers departed Boucher joined Amla and after surviving a close LBW appeal, he settled down and scored 70. Amla was clearly the star of the day for the proteas as he made 159 and guided his team to an imposing first innings total of 540. The Indian bowlers struggled in the heat of chennai with the pitch not giving them any assistance. Sehwag and Jaffer survived the new ball against the pace of Dale Steyn but they have a long way to go. Day 3 in a way will decide which way this game will go as a batting collapse by the Indians could hand the advantage to the proteas. India would be hoping to get close to the SA total and see if they can put some pressure on the visitors on the 4th and 5th days.